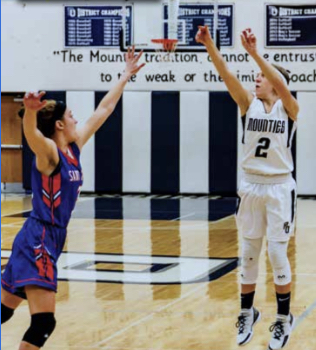 Editor’s notes: Hometown Sports editor and Chief Kenny Varner Recently caught up with new Centre County scoring champion Philipsburg-Osceola’s Halle Herrington and talked about her career, her biggest moments and her future. Her final tally of 2331 will hard to be surpassed anytime soon. HS: How did it feel to break the longtime scoring record for Centre County? HH: It felt amazing! Just knowing that I’m the leading scorer in the County and beating the 30-year old record felt great. HS: How long have you been playing basketball and what is your favorite part about it? HH: I have been playing since second grade. My favorite part is playing with my teammates and just playing the sport and just having fun. HS: Are you planning on going to college and taking your game to the next level? HH: I do plan on going to college to play but I’m not where yet. HS: Do you know what you’ll be majoring in? HH: I think I’m going to major in buisness management. HS: Most people know you as a great basketball player but some might not be aware that you are also strong in golf. Tell me about your love for golf and when you started playing that. HH: I actually started golfing my seventh grade year because my brother started golfing. Every time he would go out, I would want to join. Anything that he did I wanted to be better at than him. So I had to be better at him in golf. HS: Do you compete in any other sports? HH: No, just basketball and golf. HS: Other than capturing the scoring record, what would you say was your favorite basketball memory? HH: I would say just competing with my teammates. HS: Your team qualified for the post season. How does it feel to have one more game at least to play? How’s the team looking going into the game? HH: The team is looking really good. Since we didn’t make the playoffs last year, we even more motivated this year and knowing that we play Central we tied the season series. Knowing that we have a chance of winning a district playoff which is something we haven’t done in a while would be nice. HS: What advice would you give to youngsters who are just getting started playing basketball? HH: Definitely stay with it. If your love for the sport is there dedicate your time and getting in gym. But just have fun with it.